Does Dig Through Time trigger Miracle? Legality of Dig Through Time and Treasure Cruise? Chromatic Lantern . Not as good for you as you're only 2 colours. Try Izzet Signet . 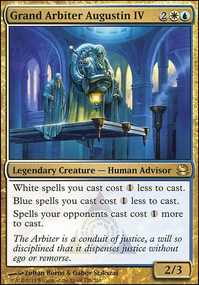 Baral, Chief of Compliance . 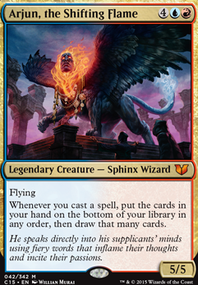 The first ability is a redundant with Mizzix. Could be worth it if you wanna be that guy who runs loads of counters. Electrostatic Field . Too cute. Sphinx-Bone Wand ? Enigma Drake . Bit of a non-bo if you start exiling your graveyard spells. Hey, saw your forum topic asking for help. Nice budget deck :) What is the max budget amount? If you would like I offer more help. Good luck with your deck. Hey, nice budget version of Yuriko. 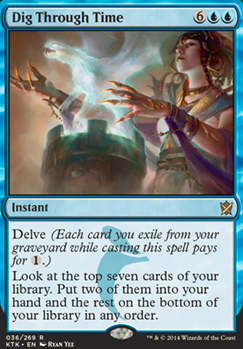 Delve spells are quite powerful with Yuriko's reveal ability because they have high CMCs, but their mana cost can be reduced by you by exiling cards from your graveyard including lands. 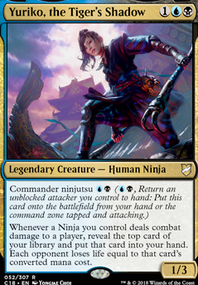 Thalakos Seer : draw engine with Yuriko. Smuggler's Copter : flying and good enabler for delve. Mausoleum Wanderer : flying and can protect you from a board wipe or other removal. Wingcrafter : two flying creatures. Brainstorm : draw three and arrange the top of your library. Skullclamp : lots of 1 toughness creatures here makes this very nice backup draw. Wandering Fumarole is a main board pick for me, mainly due to the low density of creatures that control decks usually carries, so a land that can turn into a win condition against other control decks, or a blocker against more aggressive decks is very much needed. I would trade it out for Lavaclaw Reaches due to the fact that its colors are a lot easier to get to and add to your deck based on how wizards seems to not like the enemy color pairings but its also more expensive than a pick I would rather use over lavaclaw: Mishra's Factory , since it can be a very cheap attacker that allows you to keep up counter magic more effectively and turn it into a 3/3 after summoning sickness passes when you need to block. on the topic of lands City of Brass does more harm to you than good, especially against aggressive matchups, or storm. 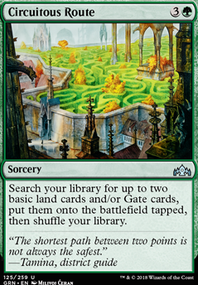 I don't know about Volrath's Stronghold in a deck that doesn't: A: have very many creatures, and B: is not focused on a creature combo like Kiki-Jiki, Mirror Breaker and Pestermite . And even then you have Kolaghan's Command to get back a threat anyway. If you want better recursion against a good portion of decks that's repeatable and punishes aggro decks look for The Scarab God , or if you want a cheap walker that can do that, look for Liliana, Death's Majesty , she makes 2/2 zombies while putting stuff in the bin for Tasigur, the Golden Fang , and reanimates something like Platinum Emperion after an Abrade . Red Elemental Blast seems like a very specific pick, I'm wondering what kind of meta garners that kind of pick, but i'm not judging. 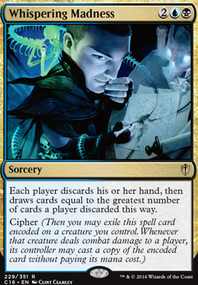 Liliana of the Veil is a good card, however I don't see how she fits with the decks overall strategy, yes she discards fueling delve, and makes an opponent sacrifice a creature, but resolving her doesn't win the game in the way Jace, the Mind Sculptor does, nor does she have the broad utility that you need for her to be that good in this type of deck. She's not good for card advantage and in fact it enables reanimator strategies where she's played in and helps decks that are more efficient than you are get ahead, and her creature removing capabilities are hindered by opposing tokens (which in that case I recommend Pyroclasm ). she's a good card, but she doesn't do that much for you. Stifle is more of a tempo pick, but if it works it works, however if your looking for a better version that has more of a control outlook try Disallow . 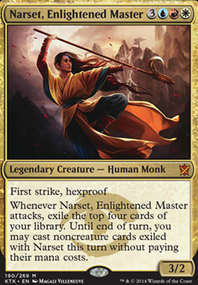 So if you're stuck on what points to put in, I would do the following assuming you either have the card or don't care about price: Ancestral Recall 7, Dig Through Time 1, and either Treasure Cruise , True-Name Nemesis , or Mana Drain 1 = 10. Otherwise, you can stick with Demonic Tutor and try using the tutors fairly instead of using it for a combo: Demonic Tutor 3, Vampiric Tutor 3, Dig Through Time 1, Treasure Cruise 1, True-Name Nemesis 1, Mana Drain 1 = 10. 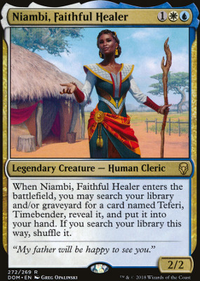 However if you want to try adding combo to your list cheaply, like I have with my Grixis control deck with Kiki combo your two points for treasure cruise and true-name would instead go to Mystical Tutor at 2. However there's still at least one more point spread, which does involve combo and changing some of your deck's dynamics and cards to support it which can hedge into dedicated combo or a control shell to protect it, and again if you don't care about price: Time Vault 6, Demonic Tutor 3, Dig Through Time 1 = 10. To find the time vault deck, go through my page and go to "recently viewed" and look for "Grixis Vault control" from the Canadianhighlanderdatabase. That's all for now, but I might comment again based on whatever feedback you need.